November | 2013 | Small Farmers. Big Change. We just received this summary of recent events in the world of Fair Trade certification from our friends at the Fair World Project. If you’re concerned about the integrity of labeling schemes, please read the various links which explain changes in labeling requirements, sourcing standards, and our responses to those changes. Fairtrade International recently released a proposal called the Fairtrade Sourcing Partnership that would allow a fair trade label (similar to the current fair trade mark used by Fairtrade International and its labeling parters such as Fairtrade America) if 100% of either sugar or cocoa are certified, even if other ingredients are not. This is a move away from their previous policy that all ingredients that can be fair trade must be (known also as commercial availability), and would apply even if the sugar or cocoa made up less than 20% of the total product (the current minimum threshold for using a seal on front of package). 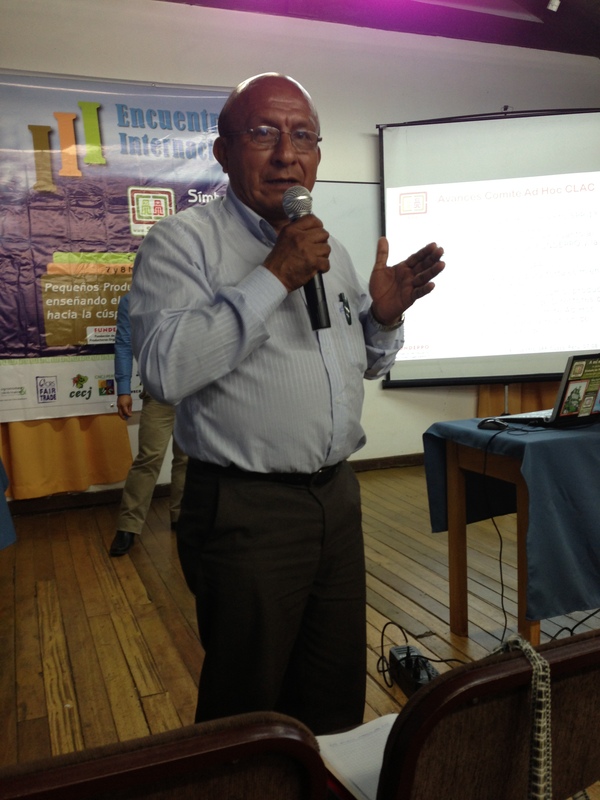 Fair World Project has expressed concern to Fairtrade International both in a joint letter with Equal Exchange, Divine Chocolate, Alter Eco, Wholesome Sweeteners, and Whole Foods Market (the largest natural product retailer in the US) and during stakeholder engagement meetings. In addition, many committed fair trade brands and producers voiced their own concern in a joint letter. On October 31, 2013 Fairtrade America sent a email announcing they would not introduce the new on-pack label into the US marketplace, but will still be considering implementation of other aspects of the initiative. Fair World Project has called upon Fairtrade International to take fully into account the risk to producers as well as the transparency to consumers of this proposal before implementing. We will continue to follow this process and take additional actions to advocate on behalf of producers and consumers if warranted. 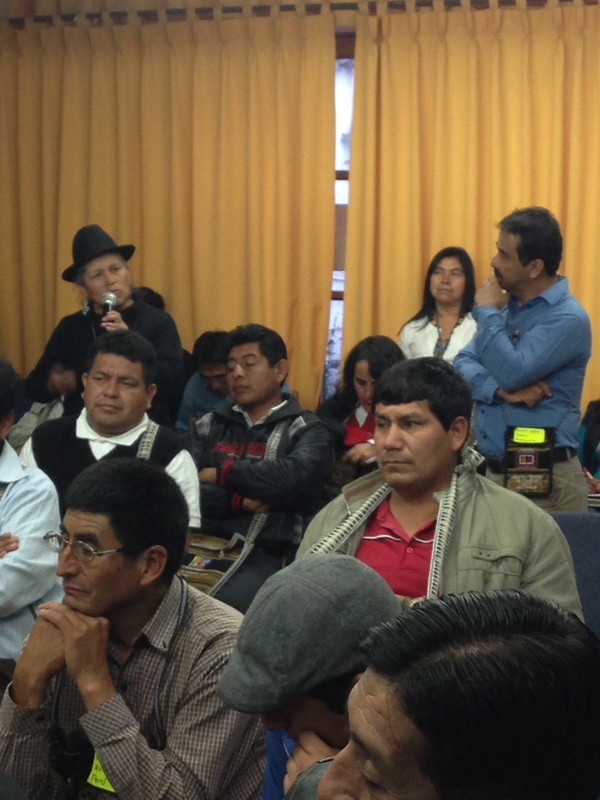 “The SPP is ours!” Over and over again, this emphatic sense of pride and ownership over a new Fair Trade certification system was voiced by small farmers during last week’s Fair Trade meetings in Cusco, Peru. And each day the momentum grew with an enthusiasm that was both deeply genuine and dizzyingly contagious. 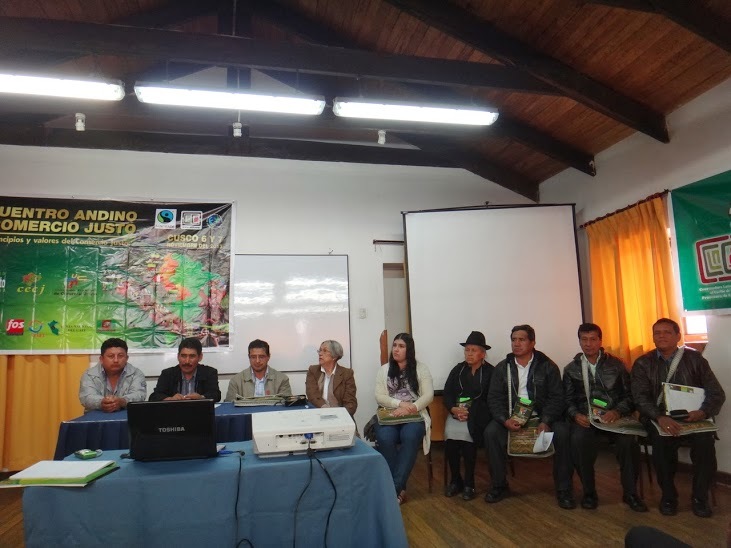 “Fair Trade is important to us,” was the message; and with the reins of this new initiative firmly held in the hands of the small farmer organizations, the future of Fair Trade indeed looks more promising. 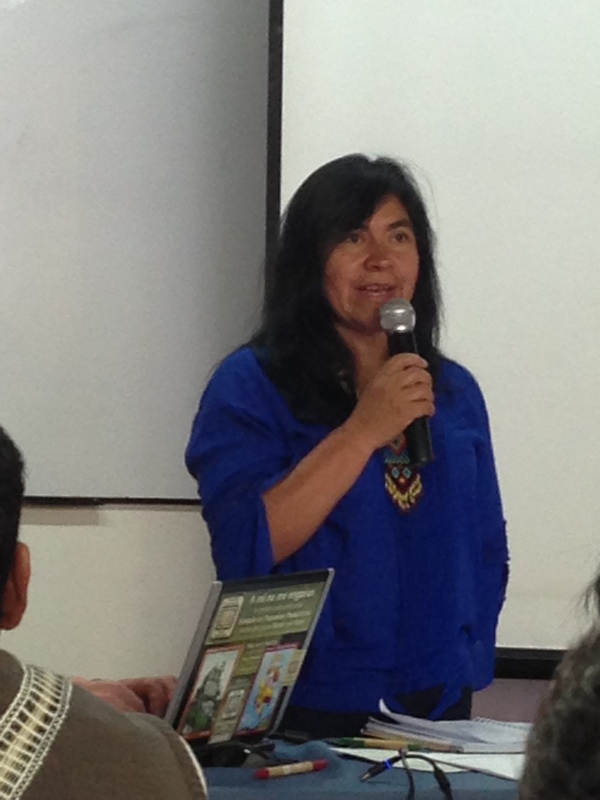 High in the mountains, ten thousand feet above sea-level, two historic Fair Trade meetings took place last week in Cusco, Peru: the Second Annual Andean Fair Trade Meeting and the Third Annual International Gathering of the Small Producer Symbol (SPP for its Spanish acronym). Cusco is the oldest continuously inhabited city in South America and it is said that there is a powerful energy emanating from its hills and valleys. I’m not much of a “new age” person, but after just four days at these gatherings of small farmer producers (mostly, but not exclusively representing coffee, cacao, medicinal teas, quinoa, bananas, and crafts); and accompanied by representatives of Authentic Fair Trade organizations (importers and coffee roasters); staff of non-governmental organizations; and students, academics and volunteers interested in the solidarity economy; I’m convinced that there is, indeed, an energy here. And last week that energy was pulsating with high-voltage intensity. No one would ever claim that democratic movement building is easy stuff or that the way forward could ever, by nature, be straightforward. There are no road maps for democracy building and the bumps in the road are as evident in this new initiative, the Small Producer Symbol, as they are in any social movement. But despite some difficult moments and challenges to overcome, the SPP movement is alive and vibrant, inspiring in what it stands for and powerful in its vision of the future. The membership is passionate, committed, and determined. The staff and board are dedicated and hardworking. The way forward won’t be easy, but the creation of the SPP offers us something palpably different, refreshingly authentic, and profoundly compelling. 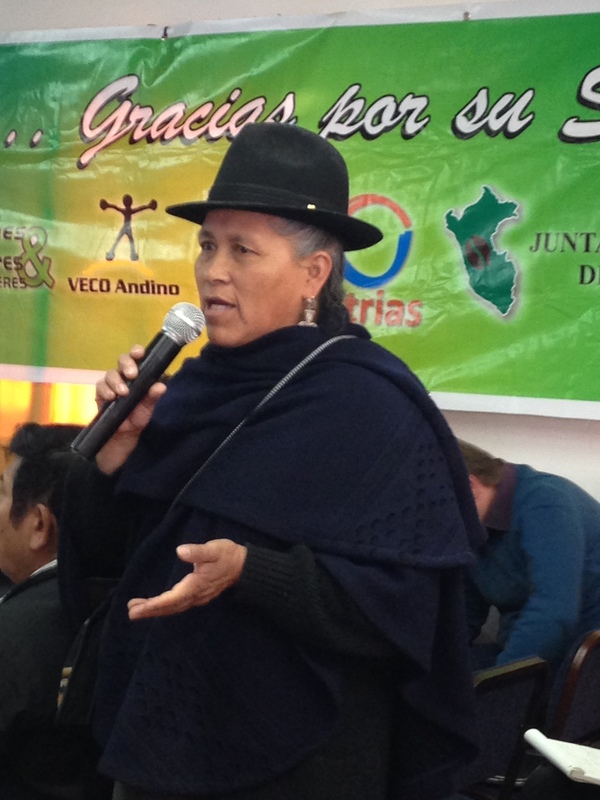 Founded by the Latin America and Caribbean (CLAC) producers in response to their frustration over the corporatization of Fair Trade, this fledgling new initiative deserves our full support. Think about it; half a century ago many small farmers were working under slave-like conditions on land owned by someone else. Through much struggle and bloodshed, eventually land reform movements of one kind or another enabled farmers to acquire small parcels of land. But land is one thing and market access is altogether another. They were better off, but life was still difficult. How could any small scale farmer in the Global South find a way to export their products and earn a dignified living? Out of necessity, farmers organized again, this time into associations, and they found economies of scale and power in numbers. But even then, more hurdles: what farmer organization could compete in the marketplace with the likes of multinational corporations such as Kraft, Dole, Chiquita, Nestles and Hersheys? And so a new movement, Fair Trade, took shape, in which farmers, traders, and consumers came together in an attempt to even out the playing field and balance the scales back toward small farmers. Fair Trade has been successful and much positive change has occurred. Because of Fair Trade, the living and working conditions of small farmers in the system have clearly improved since the days when their parents and grandparents worked on plantations. Since then, Fair Trade has grown. And grown. And grown. New products, new farmer groups, new companies, and new industries have all joined the movement. Along with them, a host of new certifying agencies has also sprung up, with new definitions, new standards, and new rules; each claiming the moral right to ensure whether everyone else is playing fair. But, as we know, growth often creates its own set of challenges and big is not necessarily better, especially when money and power are involved and those making the decisions are not the same as those whose lives are impacted by the decisions. Over time, we have increasingly had to ask: whose interests are being represented and whose are being jeopardized? Sadly, this is the context in which the Fair Trade certification system has found itself for some time now. And throughout the past few decades, Authentic Fair Traders have complained, protested, urged, advocated, and pushed for change. Some have left the certification system. Others tried to change it from within. But like the train gathering steam as it goes along, Fair Trade certification has been moving forward on its own tracks, paying no attention to the destination toward which its passengers want to be heading. Until now! 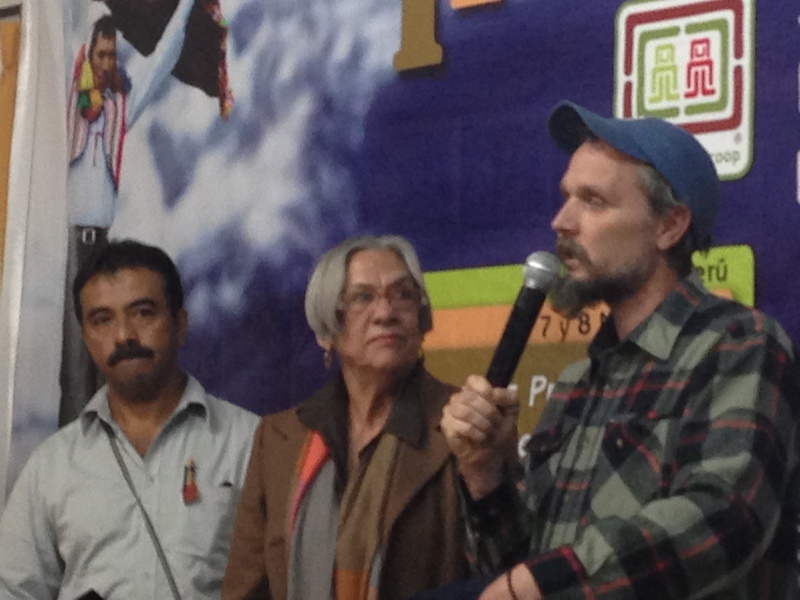 Tired of the hand-wringing and protests and seeing very little change for all the effort, the Fair Trade small farmer organizations in Latin America and the Caribbean, and their allies in the Global North, have come together again, to reorganize, rejuvenate, and recreate. Another step forward in the long journey; this time, a Fair Trade system envisioned, created, and put into practice by the very small farmer organizations who have long criticized Fair Trade certification systems for putting corporate interests ahead of all else. It’s been incredibly energizing to observe the SPP gathering momentum and building something new that better reflects the interests of its membership. During the gatherings, we heard about the challenges, listened to diverse opinions, participated in vigorous debates, and brainstormed solutions to a variety of issues. 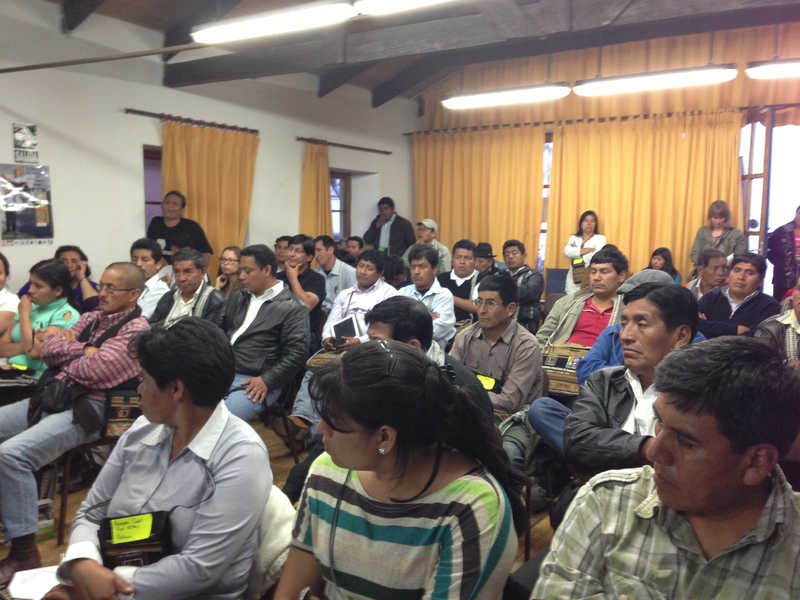 Whether the question was whether the definition of “small farmer” should be uniform throughout the system or vary from country to country; how to respond with integrity when large corporations seek to participate in the system; or even how to include the voice of hundreds of thousands of small farmer members not physically present, the participants debated with the responsibility that comes from knowing that they will be held accountable for decisions, not some “others” in an office in Europe. And yet, even during the difficult moments of these two meetings, there was undeniable current of optimism and excitement. Disagreement, yes; but honesty, participation, and ownership as well. Not a small task for any group of people. Now look around the room at the diversity of participants: ethnic, cultural, linguistic, educational, professional/vocational, and in the ages of the women and men in the room. Not a small task they have in front of them. No, not a small task that WE have in front of us. Because, the future of the SPP rests not just with the small farmer organizations; this is the new wave of Fair Trade. And like the old system of Fair Trade, from whose ashes the SPP has sprung, the beauty of Fair Trade is, and has always been, that it is truly a partnership across borders. And to reach its full potential, it will require that each one of us, from where we stand, do our part. 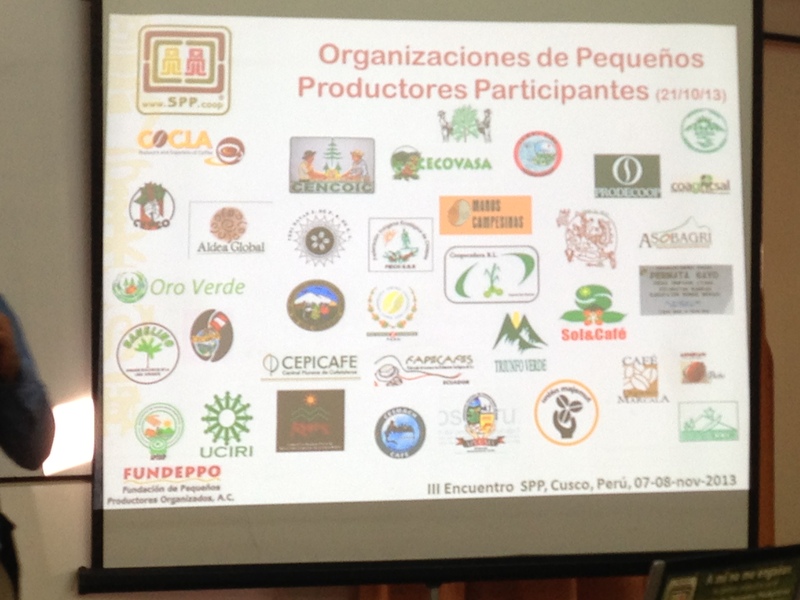 A graphic showing the newest small producer organizations to join the SPP system. 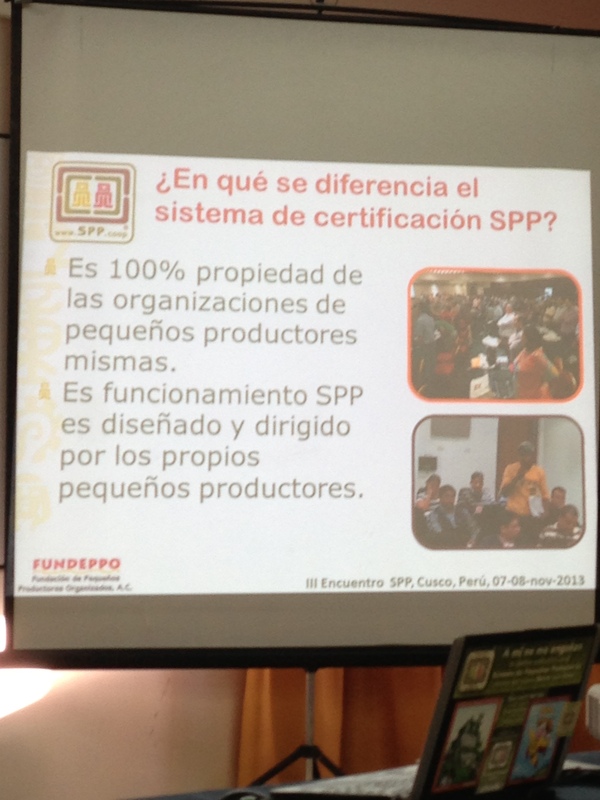 What differentiates the SPP from other certification systems? The first two factors in a long series. 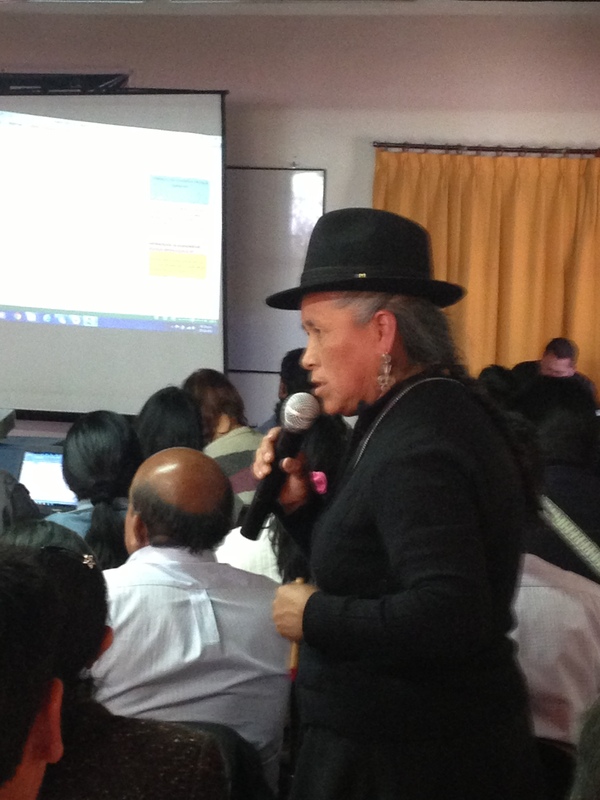 It was not an accident that Cusco, named by the Incas to be the “navel of the Earth”, was chosen as the place to host this year’s SPP meeting. 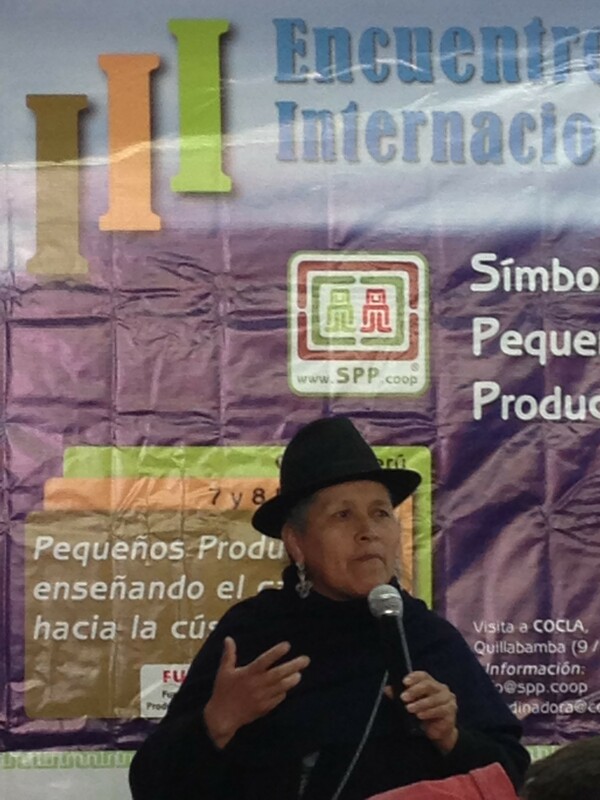 “Small Producers Showing us the Road to the Top,” was the slogan of the gathering. There’s a steadily growing power in this newly rejuvenated Authentic Fair Trade movement, and if we are very skillful and attend carefully to this new initiative, the Fair Trade small producers could just lead us to our common goal, that of achieving deep changes in our relationships to international trade and to each other.